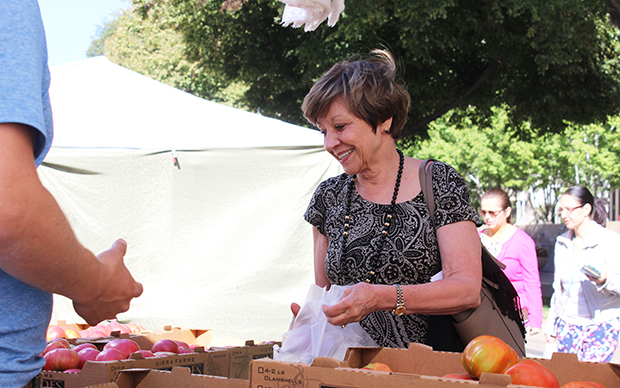 Secretary Karen Ross visited the Capitol Mall Farmers’ Market to kickoff the State Employees Food Drive by purchasing and donating over 20 pounds of fruits and vegetables from local farmers. The CDFA Office of Farm to Fork organized a fresh produce drive along with the Reverse Food Truck, River City Food Bank and the Sacramento Food Bank and Family Services, encouraging state employees to purchase produce at the market and donate it through the Reverse Food Truck. Throughout the market’s duration over 450 pounds of produce were donated. Click here to view the full story of Secretary Ross’ visit to the market.